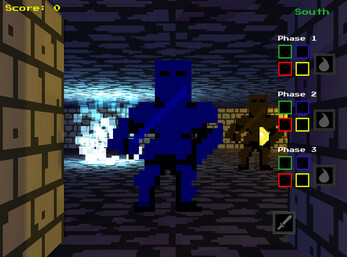 The aim of the game is to get to the exit (a glowing blue-white particle thing) while collecting coins and killing evil knights to increase your score. Use the WASD keys to move forwards, left, back and right. Q and E turn you left and right. There are 3 phases and each phase can be a different color. Click a color chip under a phase name to charge the phase with that color. Phases take a little time to charge. Make sure all phases you want to use are fully changed before you attack. Phase 1 color should be the same as the color of the Knight's body. Phase 2 color should be the same as the color of the Knight's shield if it has one. Phase 3 color should be the same color as the aura/glow surrounding the Knight if it has one. You have to be right next to the Knight to hit it. If the knight doesn't not have a shield or an aura, you don't have to set the phase 2 and 3 powers.